An airline in Indonesia just became the first in the world to try and cancel its order for Boeing’s Max planes in the wake of the two deadly crashes in Ethiopia and Indonesia within the past five months. And the move has the potential to cost Boeing billions of dollars. Garuda Indonesia has told Boeing that it wants to cancel its $4.9 billion order for 49 of Boeing’s 737 Max 8 planes over customer concerns, according to a new report by the Associated Press. The airline had originally ordered 50 of the planes back in 2014 but has only received delivery of one in 2017. 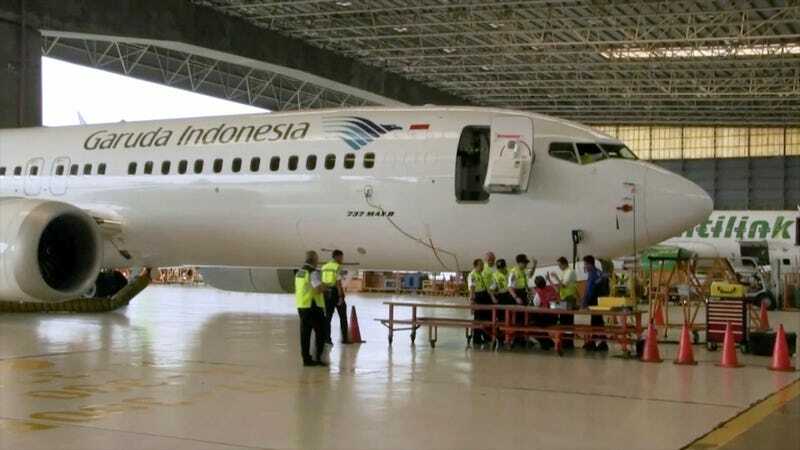 A spokesperson for the airline, Ikhsan Rosan, told the AP that customers regularly ask what kind of plane they’ll be flying on and that people “have lost trust and confidence” in the new Boeing 737 Max line. When reached for comment, a representative at Boeing told Gizmodo that they don’t comment on discussions with their customers. Thankfully for Boeing, that $4.9 billion might not all be lost. As the Wall Street Journal points out, it’s tough for airlines to just swap out planes from different manufacturers because pilots need to be trained on the specific aircraft that they’re flying. But if pilots for a particular airline are familiar with Boeing planes already, it’s easier to transition to a different Boeing aircraft. “We don’t want to use Max jets ... but maybe will consider switching it with another Boeing model of plane,” Rosan told the AP. NBC News reports that Garuda sent a letter to Boeing requesting the cancellation on March 14, just four days after the latest crash on March 10 in Ethiopia that killed all 157 on board. The first crash of a Max 8 happened on October 29, 2018, off the coast of Indonesia and killed 189 people. The cause of the latest crash is still under investigation, but the earliest reports indicate that both planes may have falsely indicated that the nose was pointed too high. Automation in the plane, called the Maneuvering Characteristics Augmentation System (MCAS), would have forced the nose down to ensure that it didn’t stall, and there are questions about whether pilots could override or counteract the automated system. Boeing has said that it will release a software update for the Max planes by April. It was recently revealed (at least to people who aren’t aircraft enthusiasts) that Boeing charges extra money for safety features that warn the pilot when there may be a false reading in the automation. There are currently 385 Max planes in the fleets of airlines around the world, but every single one is grounded over safety concerns. Roughly 4,600 additional planes had been ordered but not yet delivered, and it’s tough to see how Boeing won’t be dealing with a lot more dissatisfied customers over the coming weeks. Representatives from Garuda will reportedly meet with people from Boeing next week in Jakarta, Indonesia’s capital, to discuss their deal. It’s not immediately clear whether Boeing will accept the cancellation or if their contract will force either side to accept a different arrangement. As the Wall Street Journal notes, a typical down payment on an airplane is 5 percent, and the airlines typically start making “progress payments” roughly two years before final delivery of the aircraft.